As we are a matter of weeks away from our big move, we are learning about planes and airports. And though my 2.5 year old has been inside of a plane several times, there has been so much chaos and life out of the ordinary lately, this will be the first time she’s not a lap baby and I also wanted to take the time to better familiarize her with the airport, her plane ride, and moving. Here are some of our favorite books about planes and airports! Look Inside an Airport – Flap books are an awesome way to learn specific concepts and for kinesthetic learners (like my daughter) because you’re actually engaging with the books. Plus, they’re great for multiple ages. This particular flap book is great because you can look around every detail of an airport and even make a plane take off! 50 Things to Spot at the Airport – While not a book, this is just an awesome resource to have. It compliments the book above and is a fun way to explore while actually in the airport. I have them hole punched and on a ring so we can flip through and am even working on a printable to share with you once it’s done to help go through all 50. The cards include everything from air traffic control tower to shuttle buses and airport trains and even windsocks, waste disposal trucks, and more. Even comes with a bonus card defining flying words like “cruising speed” and “knot”. 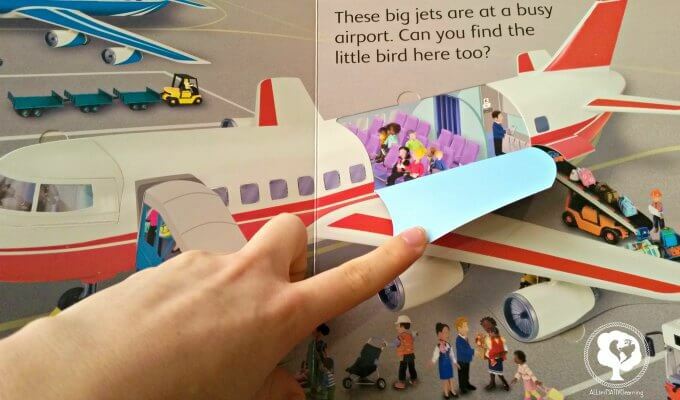 Planes Lift and Look – Another great flap book. This one you even are supposed to spot the little blue bird on each page and it’s actually a bit challenging, making it great for little learners that need to stay occupied. This is less about airports, and more about different types of planes. Wind Up Plane Book – What kid does not love a book that comes with a built in toy?! It includes different maps for the plane to fly over . Just a really cute concept and definitely an awesome book to keep kids occupied whether for a flight or just at home. 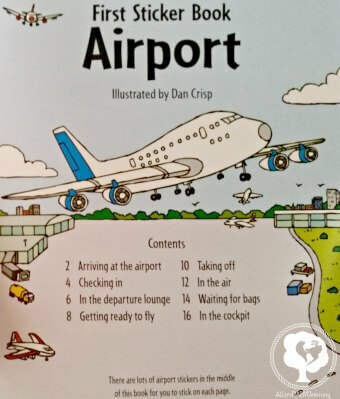 Going on a Plane: First Experiences Book – This books is ideal for younger readers to help them understand what going to the airport even means and what they will be doing once they get there. You follow a family’s adventure to the airport all the way up to them getting in a taxi to leave. That’s Not My Plane – This books is great for the youngest in your family to prepare them for flying or just expose them to a love of planes. It’s great because it has touch and feel aspects, making it a great sensor experience beyond the story. Airport Sticker Book – What I love about this sticker book is that it’s not just stickers. So instead of spending money on a sticker pad, I got a story and book out of it too that can continue to be used. Plus It’s kind of like a matching game to place each airport item where it belongs in the story. Wind-Up Bus – Traveling by bus and not a plane? Or will you take a bus or tour bus wherever you wind up? Here’s another great wind-up book where a double-decker bus travels around London! Travel Activity Pad – I am a huge believer that when traveling or when we have a big event that I need to pull out something new and special. This is definitely the key when traveling! 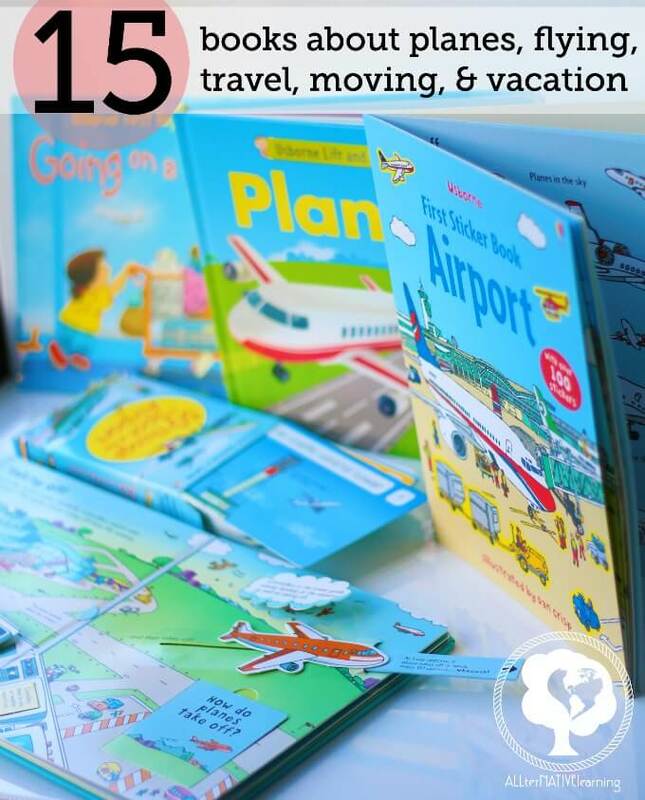 Little Children’s Travel Activity Book – Again, this is a great activity book for when traveling and on vacation. It’s both fun an educational. For instance, spot the differences games can help improve observation and attention skills or solve brain-building puzzles! 100 Paper Planes to Fold and Fly – If you want to continue on an airplane theme once you get to your destination or if you are simply studying airplanes, this is fun to have so you can fold your own paper airplanes and make a game out of it. Plus, if using them on vacation, it’s something small to pack. 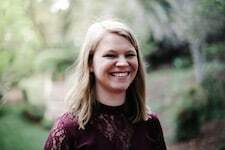 1001 Things to Spot on Vacation – Again, just a fun idea to get this book before going on vacation so that your kids have a specific book geared towards the trip, making it new and special! Great to have both on a plane or on a road trip. Lots of Things to Spot Around the World – This is a like the modern, little kid’s version of Where’s Waldo? making it great fun. Even better is that it has elements of education. So maybe you’re going on vacation and will be visiting museums, there’s even a page on what you might see inside of museums! Moving House Sticker Book – This is the story of a little family that moves houses and packs up a truck after packing boxes. The stickers each get placed in the correct location because of a corresponding picture. This one is definitely helping my 2 year old understand why we are packing up boxes!